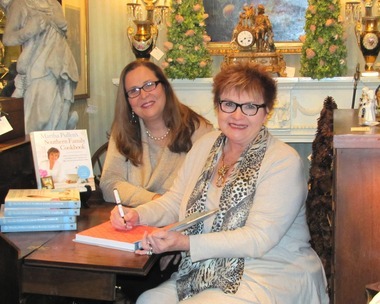 Martha Campbell Pullen, at right, and her daughter-in-law Suzanne Crocker, at left, sign books in Rivenbark & Roper Antiques in Huntsville, one of the places their new cookbook will be sold. The cookbook combines family stories and recipes. They will autograph books at the Rivenbark & Roper, Suite 111 in the Central Park Shopping Center at the corner of Bob Wallace Avenue and L&N Drive, on Thursday, Nov. 29, 2012, from 1 to 5 p.m.
HUNTSVILLE, Alabama – The best Thanksgiving gatherings are a taste of the stories of a family. Now, one of the best cookbooks I’ve ever picked up combines flavors and memories: “Martha Pullen’s Southern Family Cookbook.” These recipes, like those you have likely collected from your own mother and grandmothers, combine both memorable flavors and terrific stories. That makes for “a very tasty memory lane,” as Martha puts it in the introduction to the gorgeous new collection written with her daughter-in-law Suzanne Crocker. The book, just officially out this week from Adams Media, is stocked locally at Rivenbark & Roper Antiques, 900 Bob Wallace Ave. S.W. It’s Suite 111 in the Central Park Shopping Center at Bob Wallace and L&N Drive. Martha and Suzanne will sign books at Rivenbark & Roper on Thursday, Nov. 29, 2012, from 1 to 5 p.m. The store is open weekdays from 10 a.m. to 5 p.m. and Saturdays from 10 a.m. to 1:30 p.m. Although Martha has written books and articles for years as the head of the Martha Pullen Sewing empire, she was stumped when it came to writing her own memoir. One day, as she was adding a note to send with a recipe Suzanne had requested, she realized that all the best recipes come with a family story. And Martha remembered how she has been urging the women who attend her sewing workshops all over the country to collect their own family’s stories. “This is just for the fun of it, to tell you the truth,” Martha said recently, as she and Suzanne signed copies of the book for Ken Rivenbark, who is already stocking the book. And it’s also for the inspiration of it. For instance, Martha’s story about her grandmother, who taught at the Temperance Hill School in rural Jackson County at the tail-end of the Appalachians, will make you want to cook a huge pot of soup to share with the neighbors. It’s one of many stories she and Suzanne have folded between the recipes. “Martha Pullen’s Southern Family Cookbook” is available now. For three years, during some terribly hard times, Martha’s grandmother directed her students to bring what leftovers they could. They would mix “Schoolhouse Soup,” which would cook all day on the old wood-burning stove in the classroom, feeding the children for lunch and, usually, providing some leftovers for them to take home to their families that night. The title notes this is a “Southern Family” cookbook. But that means, in this case, that these are recipes of a Southern family who has traveled and lived widely. From West Africa, where Suzanne and her family lived for years, come recipes spiced with the flavors of Togo and the Mediterranean. As a pastor’s wife (Suzanne is married to John Crocker, Martha’s son, who is now minister for missions at Whitesburg Baptist Church in Huntsville), Suzanne learned to cook with simple ingredients and with dispatch. The recipes include delicious takes on old favorites, like “Mama’s Macaroni and Cheese,” with a crispy topping of bread crumbs, and “Mary’s Tomato Grits,” a quick brunch casserole. While a few recipes are a little exotic, “Southern” cooking, in terms of marvelously rich food, is certainly part of at least a few of the recipes. That’s particularly true for those that Martha and Suzanne have pulled from their stock of old family favorites. Aunt Mary’s Cream Cheese Blueberry Pound Cake, for instance, includes — oh my goodness — three sticks of real butter, a cup of cream cheese and –count ‘em — six eggs. That recipe may be for special occasions, but the book itself is for any kitchen. Devotional-style reminiscences are mixed into the book like blueberries into Aunt Mary’s pound cake. The delicious quotes from the Bible, the enticing blanks at the end of each chapter that invite the reader to join the conversation, the included CD, with 70 more stories and a template for writing one’s own cookbook, combine to create a book that could become the center of a family’s own cooking and remembering project. Opening this book is a little like being invited to join the Crocker-Pullen family around their Thanksgiving table. And that’s a place you’d be thankful to be.